Baseline Energy, Water and GHG analysis and tracking lets you benchmark your facility and make better data-driven sustainability and energy efficiency decisions. AEI Soft Start is an annual service engagement where we collect and analyze the different sources of energy and water data for the buildings on your campus. We know this is the thankless work that no one likes to do, but with our suite of data collection tools and visualizations, the effort is streamlined, highly automated, and very economic for monthly updates to a secure web portal built specifically for you and your portfolio. The net result is less time spent agonizing over spreadsheets and better insight into your energy and water usage and trends. To achieve your sustainability and energy efficiency goals, you need a solid and consistent platform of baseline data, and that's exactly what AEI Soft Start delivers. Night and weekend setback ratio calculations; comparison to similar building types, versus occupancy, weather, etc. The initial phase of an AEI Soft Start is a discovery process where we establish the goals of the portfolio manager and the processes by which the site data is obtained. We have a prescribed set of data sources that can satisfy all of the deliverables for the reporting, analytics and monthly trending, but we will always work with management to develop alternate or additional sources of useful data. Once the processes are in place, an AEI Soft Start becomes a consistent and logical web site portal where all permitted constituents may see all of their building energy data in a clean and uniform way. If any of the deliverables seem vague or lacking in specific detail, that is because no two facilities are alike and there will always be an element of customization specific to each and every customer depending on what data they have to work with. $2,200 per year per building/account. For 5 buildings or more, each at $1,650. (Total cost for a 10-building campus = $16,500). Discounts apply to any buildings added during the 1 year engagement; there is no need to order multiple buildings at the same time. Buildings must be on Time-Of-Use rate tariffs such as National Grid B-3 or Eversource B2, B7 or choose the option for AEI Soft Start Real-Time below. For more information about AEI Soft Start, please visit our AEI Soft Start product page. 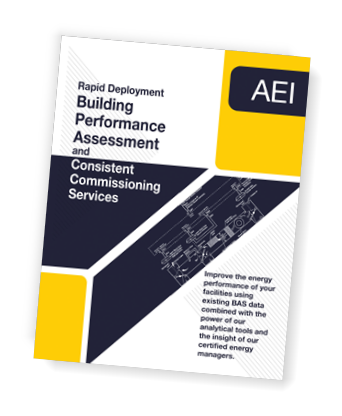 Or contact us to receive a copy of our AEI Soft Start case study titled "An Energy Review of Boston City Hall and Other Selected Facilities" which shows an AEI Soft Start for selected facilities in the City of Boston portfolio. Delivers interval data for buildings that are too small for utility Time-Of-Use "TOU" metering. Delivers interval data in real-time, eliminating the 30-day waiting period for utility posting to EPO. With real-time main meter data, we will alert the facility with SMS or E-Mail messages when the building is getting near a new billing period peak. We alert the facility to its real-time load at the same time ISO New England is nearing a new peak hour – this is especially useful for facilities that wish to minimize their energy footprint and ICAP tag at those times when the grid might be hitting its annual peak hour. Support for kiosk displays and other integrations where we pass along the main meter data that we are collecting in real-time. Bulk data export capabilities to support your off-line analysis of the collected data. Lease Option: $1,100 lease cost per building each year, and we include the $370 annual fee for utility KYZ pulse service and the $25/month Verizon 3G wireless service. Purchase Option: $1,700 one-time, with $670/year recurring service charge. Neither option includes the facility cost to run low voltage wiring from the utility-installed KYZ breakout box to the nearest utility service room where 3G cell service is available. For more information about AEI Soft Start Real-Time and to see examples of our real-time data in action, please visit our AEI Soft Start RT product page.